Draft: 2006, Texas Rangers, 5th rd. Originally selected by the New York Yankees in the 50th round of the 2004 First-Year Player Draft out of Longview (TX) HS, but did not sign…Selected in 35th round of the 2005 First-Year Player Draft by the Los Angeles Angels, but did not sign… Selected by the Texas Rangers in the fifth round of the 2006 First-Year Player Draft…Attended Navarro College in Corsicana, TX, and ranked among national junior college leaders with 17 home runs in 2006…Named 2006 Baseball America JUCO Preseason All-American and 2006 Region XIV East Zone MVP…Played in Texas Collegiate Summer League in 2005…Has participated in the BARCS pet calendar initiative…Has continued to support numerous military programs…Ambassador of the Casey Cares Foundation, an organization that provides ongoing, uplifting programs with a special touch to critically-ill children and their families…Married, wife's name is Jill…The couple has three daughters: Ella, and twins: Evie and Grace ....Partnered with his wife, Jill, to serve as ambassadors of the University of Maryland Children's Hospital (UMCH) to help raise awareness for childhood illnesses and UMCH's role as a leader in patient care, pediatric disease research, and teaching future generations of health care providers...The Davis family hosts "Crush's Homers for Hearts," an annual charity Home Run Derby event at Oriole Park at Camden Yards that benefits the Pediatric Heart Program of the UMCH...Additionally, Davis donated $1,000 for each of his home runs to the UMCH Pediatric Heart Program during the 2017 and 2018 seasons, raising $42,000...He was the Orioles nominee for the 2017 and 2018 Roberto Clemente Award. Played in his 1,000th career game as an Oriole on 8/11 vs. BOS (G2); became the 18th player in Orioles history to reach the 1,000-game plateau...Hit a go-ahead three-run home run on 6/27 vs. SEA, it was his 84th career go-ahead home run and his 18th in the eighth inning-or-later...Hit .294 (20-for-68) in 18 games from 8/14-9/4; hit .226 (21-for-93) in 25 August games, his highest monthly average...Stole two bases (7/13 vs. TEX and 7/24 vs. BOS) for his first multi-stolen base season since 2015; has stolen at least one base in 10 of his 11 Major League seasons, excluding 2009...Scored multiple runs in three-straight games, 7/27-29; first time doing so since 7/12-14/13...Homered in back-to-back games three different times (5/8-9, 6/27-28, and 7/7-8)...Hit his 11th career Eutaw Street home run (the most all-time) on 6/27 vs. SEA... Since the start of 2012, ranks fourth in the majors among active players with 239 home runs. Since the start of 2012, ranks second in the majors among active players with 223 home runs...Ranks 10th among active players with 370 extra-base hits during this time...One of seven Oriole hitters with 20-or-more home runs...He joined Welington Castillo, Mark Trumbo, Manny Machado, Jonathan Schoop, Adam Jones, and Trey Mancini with at least 20 home runs with the Orioles...The 2017 season marked the second time in Orioles history (since 1954) that the team has had seven players with 20-or-more homers in a season (also 1996)...According to STATS, LLC., the 2017 Orioles were the sixth Major League team with at least seven players with 20-or-more home runs in a season, and first since the 2010 Toronto Blue Jays...Hit his 224th career home run as an Oriole on 9/22 vs. TB to pass Rafael Palmeiro (223) for sole possession of sixth place on the Orioles all-time home run list (since 1954)...Collected his 1,000th career hit with a double in the ninth inning on 8/25 at BOS; of his first 1,000 career hits, 219 came with TEX (4 seasons) and 781 with BAL (7 seasons)... With his home run on 8/31 vs. TOR, Davis passed Rafael Palmeiro (124) for second on Oriole Park's all-time home run list; currently has 127, trailing only Adam Jones (137)...Had a seven-game hitting streak from 5/30-6/6 (.333, 9-for-27, 3 HR, 5 R, 7 RBI, 1 BB)...Hit his eighth career grand slam 7/18 vs. TEX, also homered earlier that night...It marked is 19th career multi-homer game... Drove in a career-high six RBI in the game...Became the first player in Orioles history (since 1954) to hit two extra-inning, go-ahead home runs in the same game (5/16 at DET, 12th inning/13th inning)...Became the first Orioles player with multiple extra-inning home runs since Mike Young on 5/28/87...According to the Elias Sports Bureau, Davis and Matt Adams are only players with multiple home runs in the 12th inning or later of a game...Was the second player in the Expansion Era (since 1961) to hit two go-ahead home runs in extra-innings joining Matt Adams (STL) on 9/4/13 (at CIN, 14th inning/16th inning)...Was a part of both triple plays turned by the Orioles; a 6-4-3 in the bottom of the eighth on 5/2 at BOS and a 5-4-3 in the top of the second on 8/3 vs. DET...Placed on the 10-day disabled list from 6/14-7/14 (retroactive to 6/13) with a right oblique strain. Earned second Most Valuable Oriole Award, as voted on by local media • Led the majors in home runs (47), finished third in RBI (117), seventh in slugging percentage (.562), 13th in runs scored (100), and 10th in batting WAR (3.7) and 23rd in WAR (4.5) • His 47 home runs were the fourth-highest single-season total in club history (since 1954)...Became the first Oriole in club history to log two separate 40-homer seasons • Slugged his 200th career home run on 9/30 vs. TOR (GM 2)...Logged his 500th career RBI on 7/30 vs. DET • Hit a walk-off single in the 13th inning to give the Orioles a 6-5 victory 9/15 vs. BOS...Hit two walk-off home runs (8/15 vs. OAK, 9/2 vs. TB) • Led the Orioles in batting average (.293), on-base percentage (.409), and slugging percentage (.669) after the All-Star break (min. 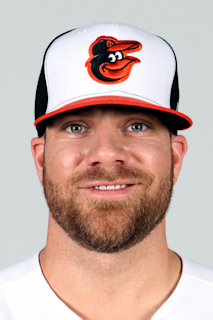 237 plate appearances) • Led the club in home runs (28), RBI (65), walks (46), tied for first in doubles (16), and ranked second in hits (78) after the All-Star break • Entering 2016, ranks third on the Oriole Park all-time home runs list (95) and 10th on the Orioles all-time home runs list (161) • Became the first Oriole to post two separate 40-home run, 25-double seasons (also did so in 2013 with 53 HR, 42 doubles) • Is the fifth Oriole to hit at least 30 home runs in three separate seasons (also E. Murray, five seasons; R. Palmeiro, four seasons; B. Powell, four seasons; F. Robinson, three seasons) • Posted eight multi-homer games and has logged 15 multi-homer games in his career...Led the majors with eight multi-homer games • Posted a career-high tying 11-game hitting streak, 6/20-7/1, batting .341/.413/.683 (also 9/22-10/2/12) • Hit the 82nd Eutaw Street home run in the history of OPACY, 8/14 vs. OAK, his third of the season (also 4/29 vs. CWS, 6/16 vs. PHI)...It was the 34th by an Oriole • His eight career Eutaw Street home runs are the most by an individual player in Oriole Park history (surpassed Luke Scott's six on 6/16 vs. PHI). Placed on the 15-day DL, retroactive to April 26, with a left oblique strain…Reinstated from the DL on May 11. Placed on the Paternity List, May 25-27. Had a career-long 20 game streak of reaching base safely, April 2-24, during which he batted .268/.393/.408. Collected second career three-homer game, May 20 @PIT (also August 24, 2012 vs. TOR), collecting career-high tying 5 RBI, joiningBoog Powell and Eddie Murray (3) as the only players in club history with multiple three-homer games…It was the 19th three-homer game in Interleague Play history. Hit two grand slams, the first of which was his 100th career HR as an Oriole (June 17 @TB). Hit second-career walk-off HR, June 23 vs. CWS (also May 14, 2009 vs. SEA) as a pinch hitter, giving the O's a 6-4 win. Was the O's first pinch-hit walk-off HR since Larry Sheets, August 24, 1988 vs. SEA. It was the second pinch-hit home run of his career (also September 10, 2010 @LAA). On July 7 vs. WAS, paired with J.J. Hardy to hit O's first back-to-back homer in extra innings since F. Robinson and Powell, June3, 1969 vs. OAK. Hit the 150th homer of his career, August 8. On August 25, joined Delmon Young and J.J. Hardy to hit back-to-back-to-back homers, the O's first since May 10, 2012 vs. TEX (G1). Suspended 25 games by MLB on September 12 for testing positive for an amphetamine. Was acquired by the Birds July 30, 2011 from the Texas Rangers with RHP Tommy Hunter in exchange for RHP Koji Uehara ... Homered in his second game for his first hit as an Oriole August 2 at Kansas City off Everett TeafordPosted a season-high three hits on September 8 against New York and September 19 at Boston ... Drove in a season-high three runs September 14 against Tampa Bay ... Struck out five times September 7 at New York, the most by an Oriole since Phil Bradley September 7, 1989 at Texas ... Appeared in 48 games for Triple-A Round Rock (Rangers), batting .368 (71-193) with 14 doubles, a triple, 24 homers and 66RBI ... Went 9-for-17 (.529) with two doubles, four homers, five runs scored and 10 RBI in the first four games of the year for theExpress ... Had five multi-homer games for the Express, including a three-homer night against Iowa on April 9 ... Drove in four or more runs in a game five times, including five-RBI efforts on April 9 against Iowa and July 20 against NewOrleans ... Posted three six-game hitting streaks (May 24-29, June 18-23 and July 17-22) ... Was 7-for-10 with four homers, six runs scored and nine RBI in three games June 18-20 against Omaha ... Went 5-for-13 with four homers and eight RBI in three games June 26-28 against Oklahoma City ... In 21 June games, batted .361 (30-83) with 10 homers and 28 RBI for the Express ... In 31 home games for the Express at Dell Diamond, hit .403 (50-124) with 20 homers and 52 RBI ... Batted .417 (10-24) with runners in scoring position and two out for Round Rock. Was with Texas for 3 separate stints: Opening Day-April22, July 9-28, and Sept. 11-end of season ... did not appear on anyof the Rangers' postseason rosters...spent the balance of the seasonwith Oklahoma City (AAA). Combined to hit .238 (93-391) with 21 home runs, 15 doubles and 59 RBI in 113 games over his 2 separate stints withTexas...finished fifth on the club in homers and sixth in RBI ...had seventh-most strikeouts in the A.L. (150)...started 92 games atfirst base, 10 at third base, and 4 as the DH...after return on August 25, topped the Rangers in average (.308), hits (41), RBI (26),and slugging (.496) over the rest of the season. Batted .285 with 17 home runs, 23 doubles, and 55 RBI over 80 games for Texas in his major league debut...beginning withhis call-up on June 26, ranked among overall American League leaders in extra-base hits (T6th, 42), slugging (8th, .549), home runs(T8th), doubles (T10th), and RBI (T10th)...led all Rangers in each of those 5 categories as well as total bases (162) over thatspan...for the year, ranked among Texas team leaders in homers (4th), RBI (6th), extra-base hits (T6th), runs (8th), and doubles(T8th)...had 11 go-ahead RBI for the Rangers, 6th-most on the club...beginning June 29, would start 50 straight and 76 of the team'sfinal 80 contests...made 77 total starts, 46 at first base and 31 at third base...although he had played at first base throughout the early part of 2008, was switched to third late in the year when issues with Hank Blalock's right shoulder did not allow him to playthird...hit for higher average at home (.293) than on the road (.275), but had more homers (9) and higher slugging pct. (.558) in roadgames...had a .169 (10-59) average from Aug. 1-17 (16 games), but beginning Aug. 18 would hit .320 (40-125) the rest of the wayto finish at .285...opened career with season-high (twice) 6-game hit streak from June 26-July 2, T2nd-longest to begin a career inTexas history...had 4 straight multi-hit games July 22-26...recorded 26 multi-hit games, including career-high 4 hits on Sept. 26 at LAof Anaheim...had his contract purchased on June 26 and made his majorleague debut as a pinch-hitter that night in Houston...recorded an infield singleto third on the first pitch of his first career plate appearance (vs. OscarVillarreal)...would score from first on the next pitch on Marlon Byrd'striple...earlier on the day of his call-up, was named by Major LeagueBaseball as a member of the U.S. Team for the XM All-Star Futures Gameset to be played at Yankee Stadium on Sunday, July 13...would not end upplaying in that game as he would stay with the big league club. Named Rangers' Tom Grieve Minor League Player of the Yearafter combining to bat .297 with 36 home runs and 118 RBI withBakersfield (A) and Frisco (AA) in second professional season...rankedsecond among all minor league players in both home runs andRBI...also placed among overall minor league leaders in total bases(5th, 296) and slugging (10th, .598)...recorded a 35-game hit streakwhile with Bakersfield, tying a California League record...ranked fourthin the California League in slugging (.573) and homers (24-tied)...led theclub in HR, RBI, and doubles despite missing the last month-plus of the season...had 5 multi-homer games (all 2-HR contests),including 4 HR in span of 2 games June 27-28...Played in Cal/Carolina League All-Star Game on June 19 at Stockton...was promotedto Frisco on July 30...had 2 HR on Aug. 10 vs. Tulsa...ranked second in Texas League with 11 HR and 25 RBI in August, earningRangers Minor League Player of the Month honors...hit .333 with 2 doubles in Texas League playoffs...played for Surprise Raftersin Arizona Fall League, going 3-for-13 with a HR and 2 RBI in 4 games. July 14, 2017 Baltimore Orioles activated 1B Chris Davis from the 10-day injured list. July 12, 2017 Baltimore Orioles sent 1B Chris Davis on a rehab assignment to Delmarva Shorebirds. July 10, 2017 Baltimore Orioles sent 1B Chris Davis on a rehab assignment to Frederick Keys. June 14, 2017 Baltimore Orioles placed 1B Chris Davis on the 10-day disabled list retroactive to June 13, 2017. Right oblique strain. January 21, 2016 Baltimore Orioles signed free agent 1B Chris Davis. November 2, 2015 1B Chris Davis elected free agency. April 7, 2015 Baltimore Orioles activated 1B Chris Davis from the restricted list. September 12, 2014 Baltimore Orioles placed 1B Chris Davis on the restricted list. May 27, 2014 Baltimore Orioles activated 1B Chris Davis from the paternity list. May 25, 2014 Baltimore Orioles placed 1B Chris Davis on the paternity list. May 11, 2014 Baltimore Orioles activated 1B Chris Davis from the 15-day disabled list. May 10, 2014 Baltimore Orioles sent 1B Chris Davis on a rehab assignment to Bowie Baysox. April 27, 2014 Baltimore Orioles placed 1B Chris Davis on the 15-day disabled list retroactive to April 26, 2014. Left oblique strain. September 6, 2011 Baltimore Orioles activated 1B Chris Davis from the 15-day disabled list. September 4, 2011 sent 1B Chris Davis on a rehab assignment to Bowie Baysox. July 31, 2011 Baltimore Orioles traded RHP Koji Uehara to Texas Rangers for 1B Chris Davis and RHP Tommy Hunter. July 23, 2011 Texas Rangers recalled Chris Davis from Round Rock Express. June 11, 2011 Texas Rangers optioned Chris Davis to Round Rock Express. June 8, 2011 Texas Rangers recalled Chris Davis from Round Rock Express. May 23, 2011 Texas Rangers optioned Chris Davis to Round Rock Express. April 13, 2011 Texas Rangers recalled 1B Chris Davis from Round Rock Express. March 29, 2011 Texas Rangers optioned Chris Davis to Round Rock Express. March 29, 2011 Chris Davis assigned to Round Rock Express. November 6, 2010 1B Chris Davis assigned to Estrellas de Oriente. November 2, 2010 Chris Davis roster status changed by Texas Rangers. October 6, 2010 Texas Rangers reassigned 1B Chris Davis to the minor leagues. September 11, 2010 Texas Rangers recalled 1B Chris Davis from Oklahoma City RedHawks. July 30, 2010 Texas Rangers optioned Chris Davis to Oklahoma City RedHawks. July 9, 2010 Texas Rangers recalled Chris Davis from Oklahoma City RedHawks. April 23, 2010 Texas Rangers optioned Chris Davis to Oklahoma City RedHawks. August 25, 2009 Texas Rangers recalled Chris Davis from Oklahoma City RedHawks. July 6, 2009 Texas Rangers optioned Chris Davis to Oklahoma City RedHawks.